Swim warm ups ensure you are ready for the big race. Swim warm ups aren’t for show. This lightweight exercise brews copious benefits that would be filtered if skipped. Understanding why swim warm ups are important and what you can do to maximize your time will enhance your performance. Better Performance – Light warmups help to improve oxygen and blood flow, which is useful for stamina and endurance. Foils Injuries – Athletes are prone to a range of strains and sprains to the muscles and joints due to fast and furious activity. Warmups prep the body for a rigorous workout so the shock effect is minimized. A good warmup can also reduce heart complications due to heavy training. Getting Ready Mentally – Every successful athlete knows the right mindset is only half the battle. The rest is talent, preparation and sheer grit. Each new warmup gears the athlete and teammates to meet the challenges ahead with a can-do attitude. It’s a part of the reason why swim team warm ups will usually include a team song or chant to help build momentum toward overcoming hurdles. Arrive on Time – Pro swimmers should set aside at least 30 minutes in advance to catch the warm up, not just the grueling exercise coaches will insist on. The warm up can take as few as 10 minutes, depending on the extent of practice needed. The Type of Warmup – Light aerobics are usually recommended. Teams should start off with shorter, low-key versions, then build speed and intensity gradually for the real practice. Keep Your Eye on the Prize – While gently easing into training, keep in mind the goals you have for the day, including a new skill you want to perfect or a new personal best. Some examples of sample team warm ups include light swims for approximately five minutes, stretches or jumping jacks, climbing in and out of the pool and others that may be recommended by a coach. D&J Sports offers a new, low cost option for swim suit warmups. It’s a budget-friendly jacket that features durable polyester, an iPod pocket to boost workouts, a front zipper and the revered Dolfin logo to the left. 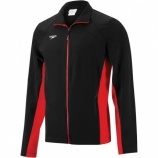 The warm up jacket is built for men and women. Contact us to learn about sizing, bulk orders, custom gear and more.